Official artwork of a biker from Excitebike. 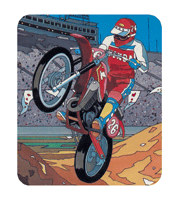 Excitebike (エキサイトバイク, Excite Bike) is the brand of eponymous motorcycle originating in the NES game Excitebike. Excitebikes as they originally appeared in Excitebike. Excitebikes made their first appearance in the NES game Excitebike. They are, for the most part, typical motorcycles that are used in Excitebike racing competitions: as they are used for sport, they have very high specifications and can perform high-profile maneuvers such as launching high in the sky off ramps. Each Excitebike is equipped with a turbo-boosting system which allows it to speed up to very high speeds, but puts a strain on the overheating engine if used for extended periods of time. On each racetrack are icons that instantly cool down the engine if the player rides over them, though. In this game, the Excitebike drivers must simply go through various obstacles and do a certain amount of laps in order to win the race. "Excitebike" also appears in the Nintendo 64 game Excitebike 64 and in the WiiWare game Excitebike: World Rally. The Excitebiker was one of many characters - such as Bubbles (from Clu Clu Land), the main character from Urban Champion, and the Balloon Fighter (from Balloon Fight) - who were considered as representatives of the NES era in Melee; ultimately this role was given to the Ice Climbers, as Masahiro Sakurai saw them as having more potential for an interesting moveset. A factor cited as to why the Excitebiker wasn't chosen was the difficulty of designing a proper jump mechanic for him. In the final game, the Excitebiker just makes a minor cameo as a trophy. Excitebike features as a collectible trophy, unlocked as one of the 100+ trophies that can be collected randomly during normal play, such as in the Trophy Lottery and throughout the various Single-player Regular Matches. The Excitebike trophy in Melee. This top-of-the-line motocross motorcycle can accelerate like crazy with its turbo, but this also causes the temperature gauge to rise rapidly; if used too often, the bike will overheat. You can cool your hot bike down by running over special icons scattered across the track. The turbo and ramps let you pull insane airs. Kirby floating over a group of Excitebikes. 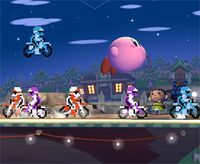 In Brawl, Excitebikes appear as an Assist Trophy: multiple Excitebikers race around the stage, dealing damage to any opponent they hit. The Excitebikes appear as 8-bit sprites in a reference to their design in the original Excitebike. The Excitebike trophy in Brawl. High-performance motocross bikes that handle massive jumps with ease. Using turbo on these beauties gives a speed boost but also causes the engine's internal temperature to rise. Overuse turbo, and the bikes overheat and shut down. The engines can be cooled by running over certain marks on the track. Excitebikes cap off every race with an undeniably awesome wheelie. Note: This is the most powerful sticker for leg attacks. The Excitebikers do not return as an Assist Trophy. The Excitebike appears as a blue item: when selected, it doubles the result of the user's spin. The Excitebike trophy is available in both versions. In Super Smash Bros. for Wii U it is part of the NES Trophy Box. 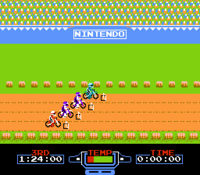 Released in 1985, Excitebike was one of the original launch titles for the NES in North America. A happy return to this racing classic, Excitebike: World Rally, was released in 2009 on the Wii. Racers use a variety of techniques in courses set all over the world. You can even make your own tracks! This popular side-scrolling game was originally released in Japan in 1984, and was then remade for WiiWare in 2010. In the newer version, players go on a world tour, racing in lots of different cities, using a huge variety of techniques. You can even create your own original courses! The Excitebike racer appears as a Spirit in Ultimate. Official artwork of Excitebike from Brawl. Bowser being hit by the Excitebikes. This page was last edited on February 18, 2019, at 04:08.